DR. MANHAR DHANAK is the Director of The Institute for Ocean and Systems Engineering (SeaTech), and Professor of Ocean Engineering at Florida Atlantic University, having previously served as a Research Scientist at Topexpress Ltd., Cambridge, UK and as a Senior Research Associate at University of Cambridge. He is the past chair (2003-2009) of the Department of Ocean Engineering at FAU. Dr. Dhanak is a graduate of Imperial College, University of London, UK and has research interests in hydrodynamics, physical oceanography, autonomous marine vehicles, including AUVs and USVs, and ocean energy. He has a significant record of sponsored research as a faculty member at FAU, encompassing over 40 separate federal (ONR, NSF, DOE, DHS, NAVAIR and NAVSEA) and state research awards, including a State of Florida award for establishing a Center of Excellence in Ocean Energy Technologies at FAU. His current on-going federally funded research activities include development of advanced energy-efficient unmanned surface vehicles and advanced-vehicle-assessment tools, characterization of electromagnetic fields associated with oceanographic features in a coastal environment using AUVs, as well as international multi-university collaborative programs spanning over 2010-2017 in the development of autonomous systems, and a Naval Engineering Education Center in support of training and education of US students in ocean engineering. 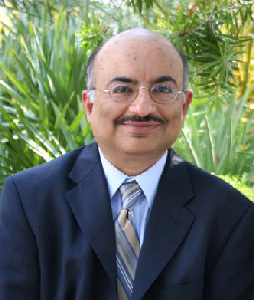 Dr. Dhanak has authored/co-authored over 90 peer-reviewed publications, including in Journal of Fluid Mechanics, Physics of Fluids and Proceedings of the Royal Society. He has published seminal papers on vortex dynamics, and was one of the first to use AUVs as mobile platforms for oceanographic observations, including measurement of ocean turbulence. He has participated in AUV-based at-sea observational field experiments in the Mediterranean and the Sargasso Seas and off the coast of Florida. He is an Associate Fellow of AIAA, co-Editor of the Springer Handbook of Ocean Engineering and co-Editor of the Springer Series on Ocean Engineering and Oceanography. He serves on the Editorial Boards of Advanced Shipping and Ocean Engineering Journal and Nature Science Reports. He has consulted on development of several outfalls off the US east coast and water intake systems for power plants in Mexico and the Philippines. He provided expert witness testimonies for an air crash in the Bahamas and for wave-induced coastal damage in Baja-California. Coherent vortex model for surface pressure fluctuations induced by the wall region of a turbulent boundary layer. M R Dhanak, A P Dowling and C Si. 1997. Phys. Fluids. 9, 2716-2731. The effect of streamwise pressure gradient on a corner boundary layer. M R Dhanak and P W Duck. 1997. Proceedings of the Royal Society. 453, 1793-1815. An Autonomous Ocean Turbulence Measurement Platform. M R Dhanak and K Holappa. 1999 Journal of Atmospheric and Ocean Technology, 16, 1506 - 1518. Coastal Oceanography using a small AUV. E. An, M. R. Dhanak, L K Shay, S Smith and J Van Leer. 2001 Journal of Atmospheric and Ocean Technology, 18, 215-234. An AUV Survey in the Littoral Zone: Small-scale Subsurface Variability Accompanying Synoptic Observations of Surface Currents. Manhar R Dhanak, Edgar An, and Ken Holappa. 2001. IEEE Journal of Oceanic Engineering. 26, 752-768. Turbulent convection driven by surface cooling in shallow water, 2002 Zikanov, O., Slinn, D. N., & Dhanak, M. R. Journal of Fluid Mechanics, vol. 464, pp. 81-111. Large-eddy simulations of the wind-induced turbulent Ekman layer 2002. Zikanov, O., Slinn, D. N., & Dhanak, M. R. Submitted to Journal of Fluid Mechanics. SFOMC, A Successful Navy And Academic Partnership Providing Sustained Ocean Observation Capabilities in the Florida Straits, W. Venezia, W. Baxley, P. Tatro, M. Dhanak, F.R. Driscoll, P. Beaujean, S. Shock,S. Glegg, E. An, M. Luther, B. Weisberg, H. DeFerrari, N. Williams, H. Nguyen, N.Shay, J. Van Leer, R. Dodge, D. Gilliam, A. Soloviev, S. Pomponi, M. Crane, and K.Carter, 2003, Marine Technology Society Journal, Vol. 37, 81-91. An assessment of the hydrokinetic energy resource of the Florida Current. Alana E. S. Duerr and Manhar R Dhanak. 2012. IEEE Journal of Oceanic Engineering. Volume 37, Issue 2, 281-293. A Spectral Method For The Triangular Cavity Flow. Arjun Jagannathan, Ranjith Sing and Manhar Dhanak. 2014. Computers and Fluids. Vol. 95, 40-48. Trajectory planning with adaptive control primitives for autonomous surface vehicles operating in congested civilian traffic. Brual C Shah, Petr Svec, Ivan R Bertaska, Wilhelm Klinger, Armando J Sinisterra, Karl von Ellenrieder, Manhar Dhanak, Satyandra K Gupta. 2014. IEEE/RSJ International Conference on Intelligent Robots and Systems (IROS 2014). 2312-2318. Adaptive sampling based COLREGs-compliant obstacle avoidance for autonomous surface vehicles. Svec, P. Shah, B. C. Bertaska, I.R. Klinger, W. B. Sinisterra, A. J. von Ellenrieder, K. D. Dhanak, M. R. and Gupta, S. K. ICRA 2014 Workshop on Persistent Autonomy for Marine Robotics (June 2014). Experimental Evaluation of Automatically-Generated Behaviors for USV Operations. Ivan Bertaska; Karl von Ellenrieder; Wilhelm Klinger; Armando J Sinisterra; Manhar Dhanak, Brual Shah, Petr Svec, Satyandra Gupta. J. of Ocean Engineering. Vol. 106, 2015, Pages 496–514. AUV-Based Characterization of EMF Emissions from Submerged Power Cables. Manhar Dhanak et al. 2015. MTS/IEEE Oceans Conference, Genoa, Italy, May 2015. Control of an Unmanned Surface Vehicle with Uncertain Displacement and Drag. Wilhelm Klinger, Ivan Bertaska, Karl von Ellenrieder, and Manhar Dhanak. IEEE Journal of Oceanic Engineering. 2016. Vol. PP. Issue 9, pp 1- 19. 10.1109/JOE.2016.2571158. Assessment of electromagnetic field emissions from subsea cables. Manhar R. Dhanak, Robert Coulson, John Frankenfield, Donald Pugsley, and George Valdes. 2016 Marine Energy Technology Symposium (METS), April 2016. Washington, DC. An USV-based Automated Launch and Recovery System for AUVs. Edoardo Sarda and Manhar Dhanak. IEEE Journal of Oceanic Engineering. 2017. Vol. 42. Issue 1, pp 37 - 55. Numerical simulation and dynamical response of a moored hydrokinetic turbine operating in the wake of an upstream turbine for control design. Parakram Pyakurel, James H. VanZwieten, Cornel Sultan, Manhar Dhanak, and Nikolas Xiros. Renewable Energy. Volume 114, Part B, 2017, Pages 1134-1145. Machine Learning based Prediction of Wave Breaking over a Fringing Reef. Nicholas Kouvaras and Manhar R. Dhanak. To appear in Journal of Ocean Engineering. Effects of EMF Emissions from Undersea Electric Cables on Coral Reef Fishes. Kilfoyle, A., R. Jermain, M. Dhanak, J. Huston, R. Spieler. To appear in Bioelectromagnetics.